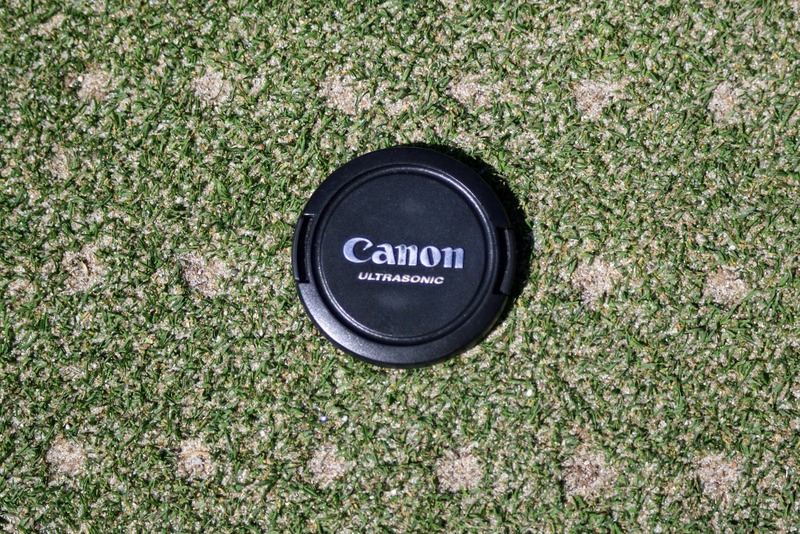 We are all well aware that aerification, overseeding and topdressing of fine turf, especially greens, is the key to their season long, high quality and playability. Not one player or maintenance staff employee likes going through the process. It is grueling. It's the hardest work the maintenance staff will perform and under the most pressure. 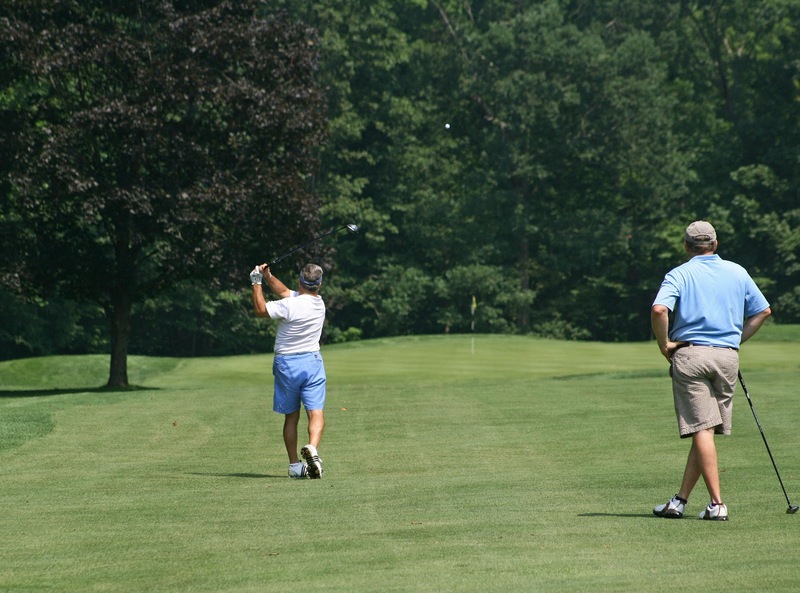 They've heard a myriad of quotes like "Just when the greens get good they tear them up!" or "this guy put way too much sand down". Superintendents have a million resources to prove the necessity of the practice and how we perform it but it rarely softens the blow. I would rather focus on what we do to shorten the time period of member inconvenience. 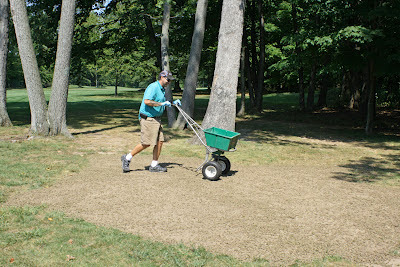 One week prior to the "hole punching" we fertilize the greens heavier and cut back on growth regulator applications. Equipment is tested and prepared. The timing of these practices are designed to keep the greens in outstanding condition until the day we begin the aerification and have recuperative potential at a maximum the minute we have started the process. Next is praying for optimal weather conditions for the allotted three days scheduled on the calendar. If it is too hot or it rains, we must delay the start because we could actually kill grass instead of improving its growing environment. 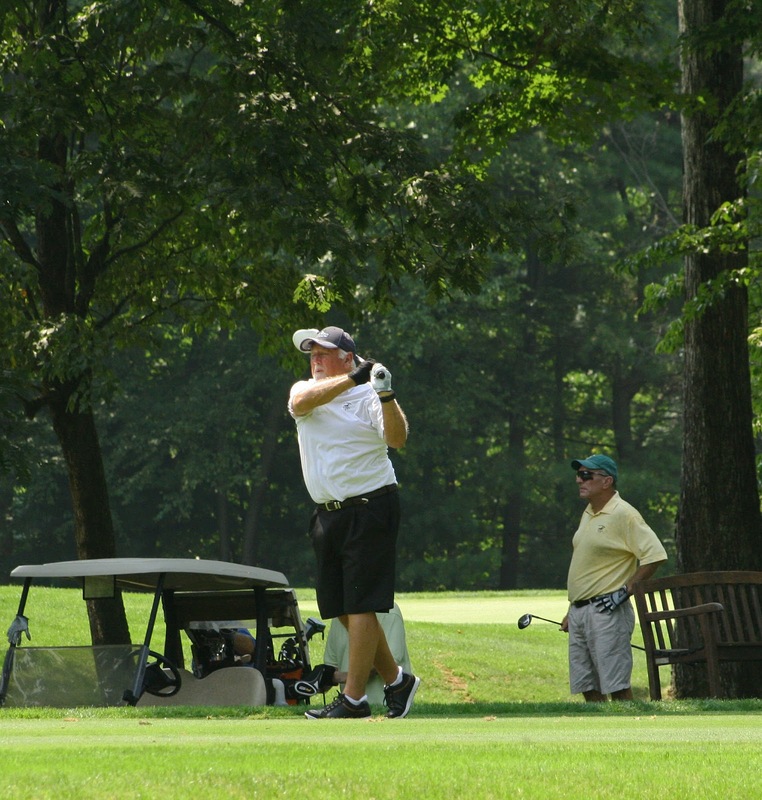 Delays, especially in late August or early September, can negitavely effect subsequent member tournaments or revenue generating outside events. 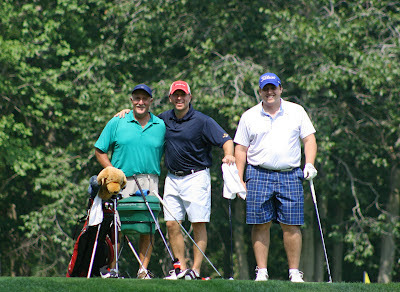 Despite some rain issues the first two days, we were able to get the front nine open on the scheduled third day. 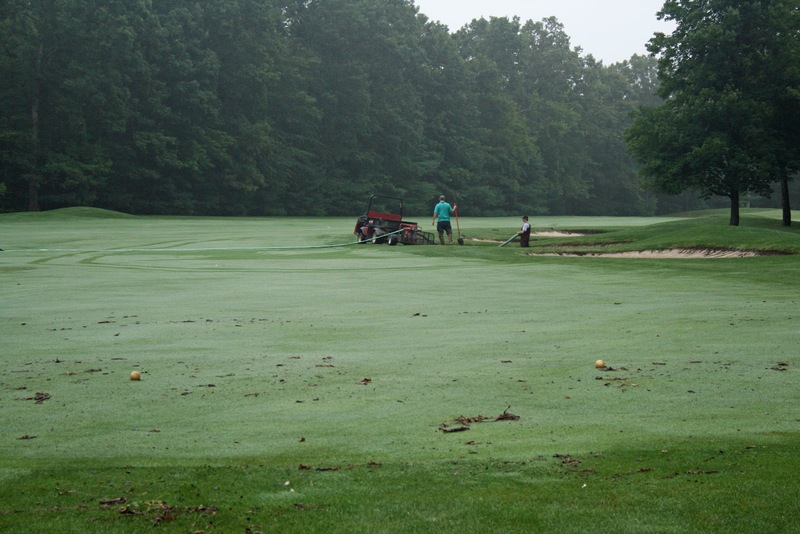 The fourth day was used for another heavy dose of fertilizer and wetting agent. This will speed the recovery rate. The fifth day was a fungicide application which protects the stressed plants. 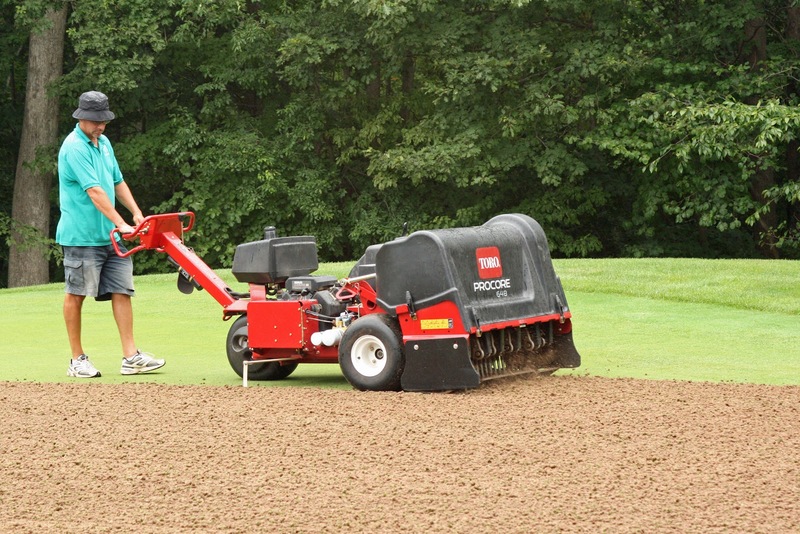 Our goal is to use every tool possible to speed recovery and playability while maximizing agronomic benefits. 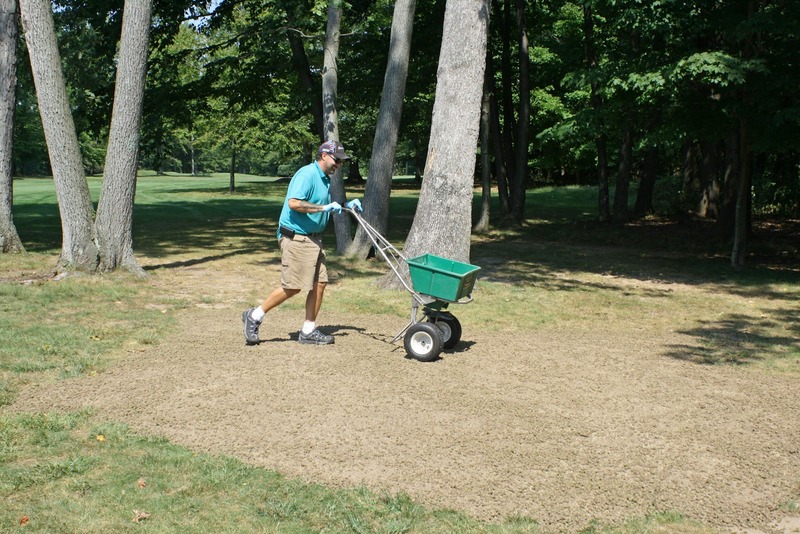 In essence we are trying to make the desirable creeping bentgrass germinate, do everything we can to get the greens to heal, then be ready to be back to premium conditions within the two weeks. 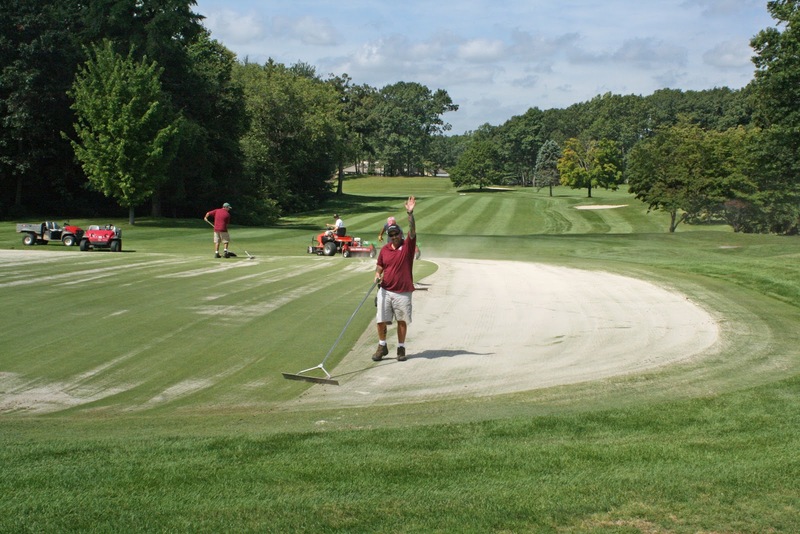 Greens this week will be slow and bumpy because the mowers, which are set at .115 of an inch, are mowing through abrasive sand. They dull quickly. We will continue to sharpen them every three days. We will roll the greens almost daily. The key, especially during week one, is performing mowing and rolling in the afternoon. Mowing and rolling in the morning, when the greens are dew covered, just brings up more sand and creates a worse putting surface. I expect conditions to improve daily. Our goal is to be back to normal conditions by September twelfth, two weeks after completion. Anytime before that is "A Win!" I wanted to explain one more benefit of aerification. The plugs that are picked up from greens (or tees) are used to repair areas in the rough around the course. A great example is along #18 cart path this spring. 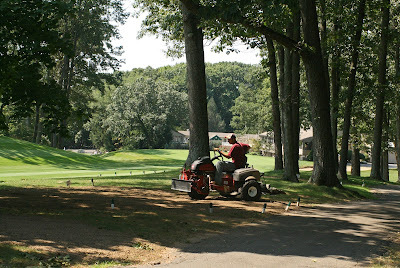 The plugs are spread, seeded and fertilized. 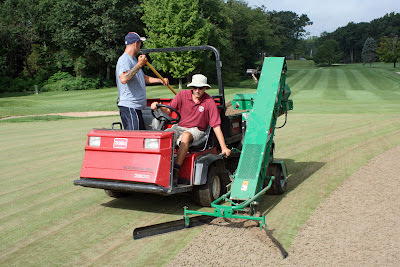 We then run the knobbed tires of the sand pro over them. This packs the material and helps hold water to improve seed germination. The maintenance staff did an awesome job, even though Mother Nature didn't co-operate completely. I know, I always want the weather to be exactly the way I want it and when I want it. Regardless of the minor set-backs from the intermittent rain on Monday and Tuesday, we've been able to accomplish all aerification and overseeding of the greens. 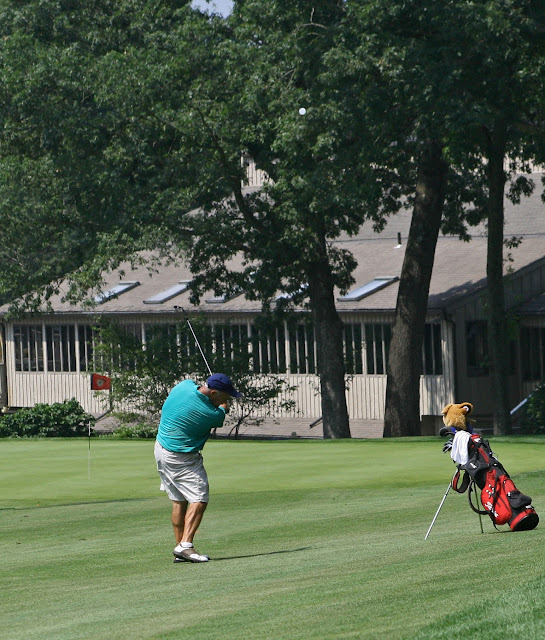 The entire golf course is now open! We will "fine-tune" the cleanup over the next few days. I encourage you to come out and play! You may be surprised how good the conditions are! The weather right now is luckily perfect for green aerification. It doesn't happen every year. Holes Seeded & Brushed In... Awesome! I wish I could keep talking, but I sent the entire staff home for a break! They soooo deserve it! I want to lead by example. Obviously, I can't win. Seriously me compared to all of them? They know I'm doing all of their jobs this afternoon and have no chance to replicate their results by myself. They will proudly and comically make me aware. I'm hoping their awareness shows them my appreciation. 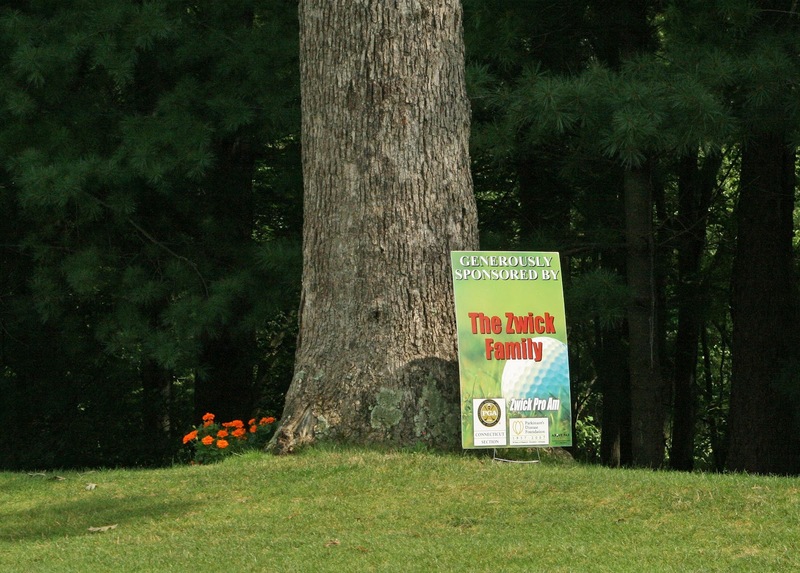 The Zwick 2012! Fight Parkinson’s!!! Always a fan favorite!!! Many know why... Some just enjoy... a few show up because of the Buzzz! JIM HANLON & Company!!! Are you kidding me??? Honestly I don't know everyone included in the "& company" and I don't want to leave anyone out! What Jim "& company" continues to achieve, on a yearly basis, is amazing. I really don't think people know. Here is what I found on google... Jim didn't tell me and I bet he doesn't even know!!! Club Championship! Course Conditions After 2.7 inches of Rain! All groups and their flights started their respective club championship competition today. 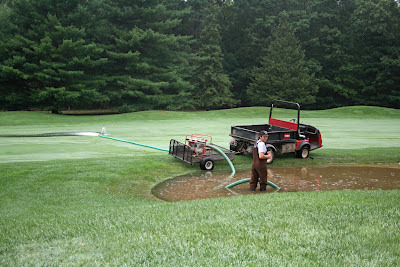 Yesterday's 2.7 inches of rain, in one hour, gave us a very challenging morning today. 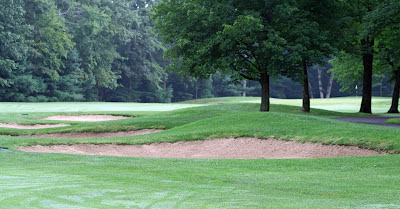 While that type of heavy rain has its benefits (water does not soak in and allows us to give players good greens and reduce cart restrictions), it also has a negative effect... Every single bunker is completely washed out and needs repair. Many bunkers also need water to be pumped out before those repairs can be made. I have talked about this over and over and shown you all the pictures. 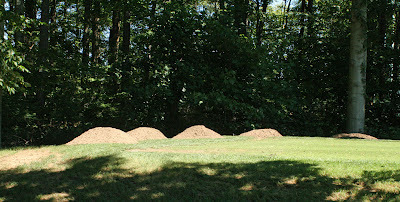 Here is a small sample of what we were faced with on one hole... #10. You can see the rest of the pictures in the slide show. Pay attention to what we see and repair before you see anything. Starting to pump fairway bunkers on #10. Notice debris from flooding in beginning of fairway. This is what you see when you play #10 at 8am. 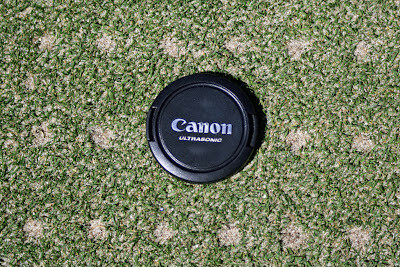 I am not going to print any more pictures of the "before and afters" on each hole... Enjoy the slide show. There are some pictures of what we were faced with. There are 68 bunkers on the course. Obviously we were challenged. I'm very proud of the maintenance staff's efforts this morning! 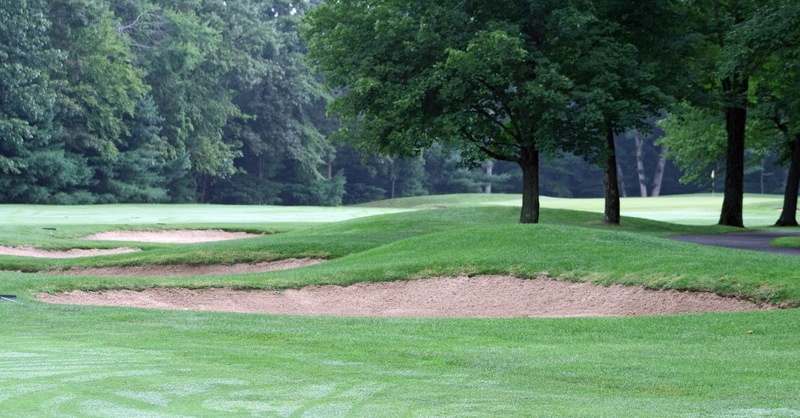 They did everything they could to give our members the best possible golf course! Club Championship Qualifying Started Today! Today was the day for the men's divisions to declare which club championship flight they would qualify for, then compete for the available spots; (8 teams per flight). It is always an intense competition to see who earns a spot in their declared flight. The actual competition starts tomorrow! Saturday, August 11th will be the date that all finalists will be determined. The finalists, from all categories, including FWGA and juniors, will compete Sunday, August 12th to determine the divisional club champions. Good Luck To All!!! It's fun! Doesn't matter how you slice it!